From my front door: Sun bursts through at day's end after snowstorm. Unretouched colors. Four vehicles in ranger housing means people are coming back! It’s that magical time of year when new seasonal staff arrive at parks around here. After the halcyon days of winter, where the few remaining rangers begin to be able to finish one another’s sentences or (heaven forbid) think one another’s thoughts, the influx of new blood is welcomed. They bring with them new ideas, new perspectives, new ways of seeing the too-familiar. Even if it’s only directions to find our bathrooms outside, it’s refreshing. This winter I was delegated the responsibility to interview and hire our three student interns supplied by the Student Conservation Association. My boss did the same for the seasonal park rangers. Together we tried to select people we thought would not only do a good job, but would adapt well to an isolated living/working situation and who would complement the mix of staff already here. With a clan as small as ours, it takes only one bad apple to make things miserable for us all; we ask candidates lots of questions to try to get a whole picture of who they are and how they’ll fit. Airport Tower reigns over the canyon landscape of Island in the Sky district. 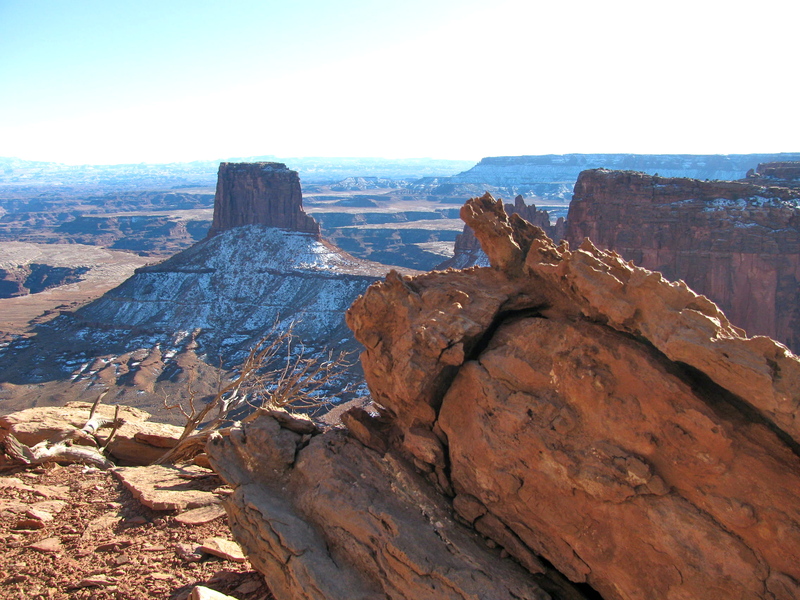 Two thousand feet of elevation separate the mesa top from the Colorado River, which carved the basin in this photo. 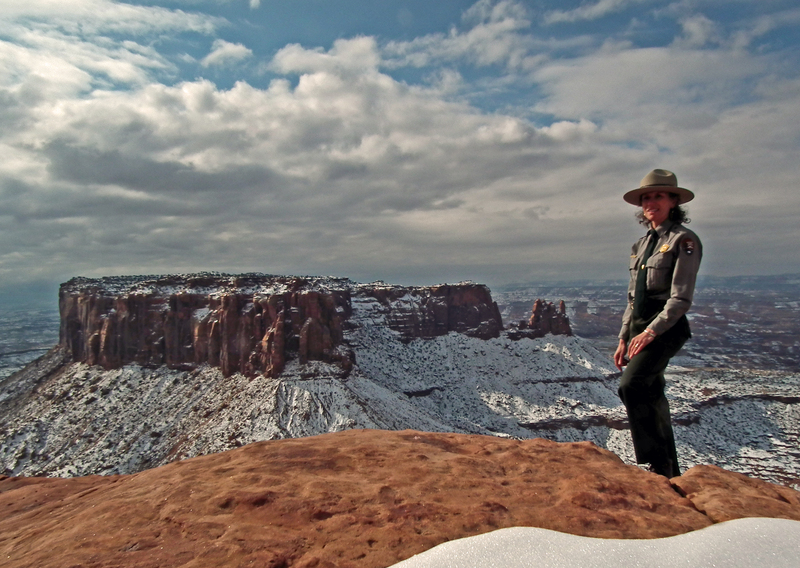 Repeatedly, visitors to Canyonlands National Park make exclamations like “This is an amazing place!” or “There is nothing like it!” or “It has captured my heart!” I say the very same things, and I work/live here for that reason. People’s descriptions tend toward the hyperbolic because words are inadequate; “I’ve never seen anything like it” is the closest many can come to truth. Visitors are captivated by our remarkable fauna, like the desert bighorn sheep (Ovis canadensis), peregrine falcon (Falco peregrinus) or the collared lizard (Crotaphytus collaris). Visitors appreciate the resilient plants, adapted to harsh conditions that would wipe out most species; the fragility of the ecosystem boggles the mind. But what really strikes people with unspeakable awe — what really steals their heart — are the canyons, cliffs, and cake-layers of rock, with a backdrop of snow-capped laccolithic mountain ranges. In a word, the geology. Forget what you may have experienced in GEOL 101 in college, where a boring lecturer showed Ektachrome slides of lumpy things that all looked vaguely similar, accompanied by black-and-white stratigraphic columns with many zeroes down the timeline on the side. No. Just come and stand at Grand View Point for fifteen minutes. Let your eyes trace the intricate carvings through seven — SEVEN! — different sedimentary layers. Geology is storytelling at its best. Geology wows. 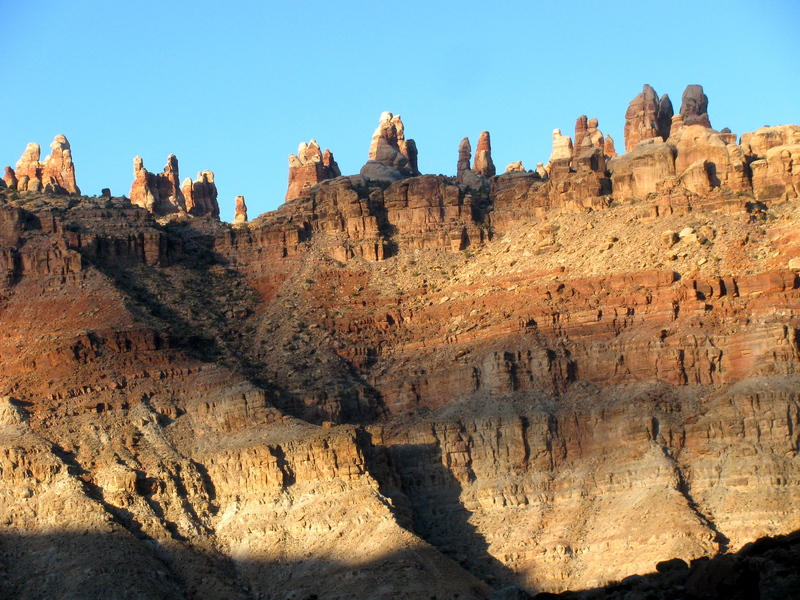 Geology is what brings travelers back, over and over and over. I’m just beginning to prepare my 30-minute formal geology talk, to be given at aforementioned Grand View Point, and I think it will dare to offer a comparison between rock layers and movements in a symphony. Stay tuned. What is one thing, even more important than the absent Starbucks and gas stations about which visitors ask, that is missing from our mesa top? One thing that, by its lack, explains almost everything about our habitat? One thing that is singularly responsible for this national park looking the way it does? Hint: it arrives from the sky, but more conveniently in 6,000-gallon trucks. It is stored in two 30,000-gallon buried fiberglass tanks up on the hill behind our housing. It is also currently going missing, to the tune of 900 gallons a day unexplainably disappearing, leaving our maintenance crew checking every valve and meter on the premises. We don’t see any obvious leaks, but our water is not where it should be. I appreciate the man who delivers this life-giving elixir. Seven times in two days, this water truck has made the 35-mile gradual climb from Moab (4000 ft) to Island in the Sky (6000 ft). That’s some expensive water we drink, flush, wash with, bathe in. The raven I saw yesterday, drinking from a pothole puddle of melted snow, doesn’t know about our scarcity. Do we save, or spend, wilderness? “The Doll House” formation sits atop a 1000-foot cliff in the Maze District. 11/2/11. Few people get to see this extravagantly wild area. This quote by Aldo Leopold is a bit disconcerting. I have nothing but deep respect for this man who did more to shape environmental ethics in the 20th century than nearly anyone else, but it is my sincere hope that we can protect our wild places without ruining them. 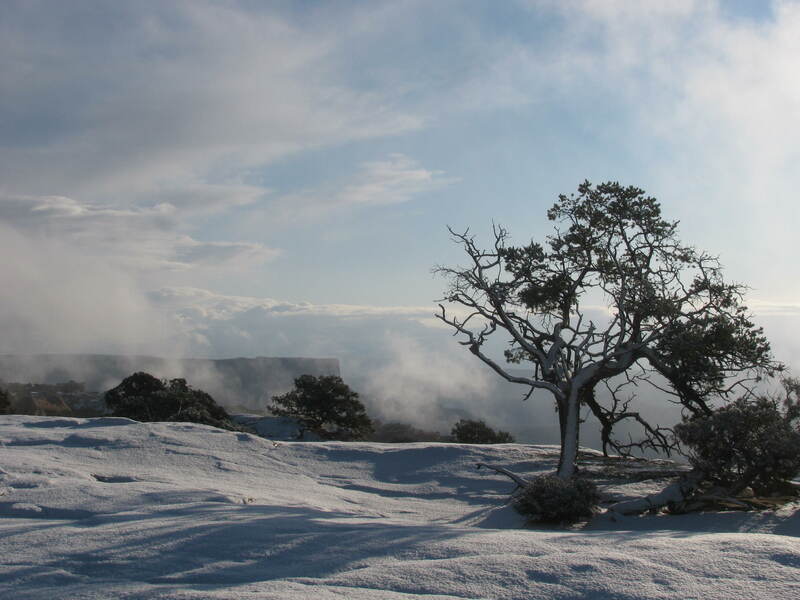 There is a corner of Canyonlands National Park, the Maze District, that is about as wild and inhospitable as anywhere in the lower 48 states. No paved roads exist; access is by high-clearance 4WD, horseback, or backpacking. 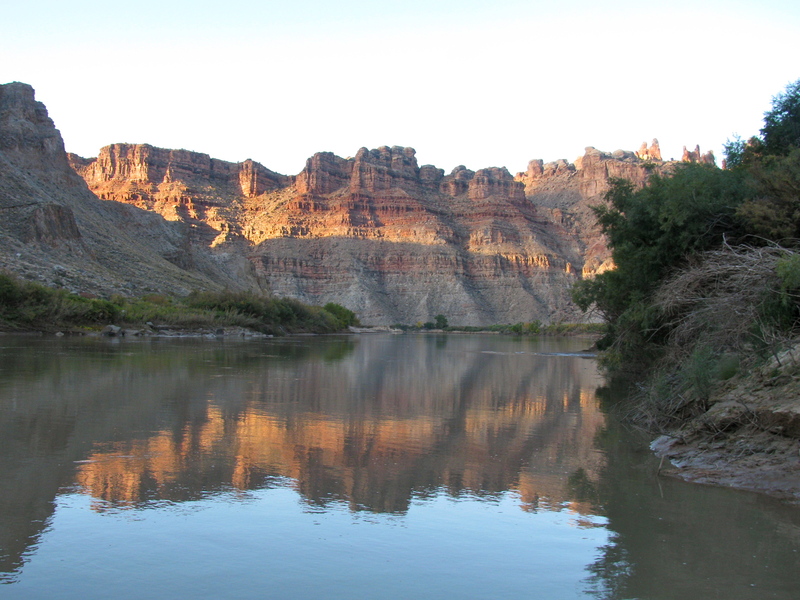 The only way I was ever able to set foot there was via a raft trip on the Colorado River through Cataract Canyon. It is so remote, so isolated, that outlaws such as Butch Cassidy used the area in the late 19th century to hide out from the authorities after robbing a bank or payroll train. There really is nowhere quite like it, and I tremble to think what a loss it would be if that place were fondled to death as Mr Leopold surmises. Do you agree or disagree with this quote? Is Leopold’s premise necessarily true? If so, should we bother setting aside untrammeled areas? Throughout time, artists who flaunt traditional approaches have been both reviled and praised. I wonder if that has always been the case? Would a millennium have changed human behavior? 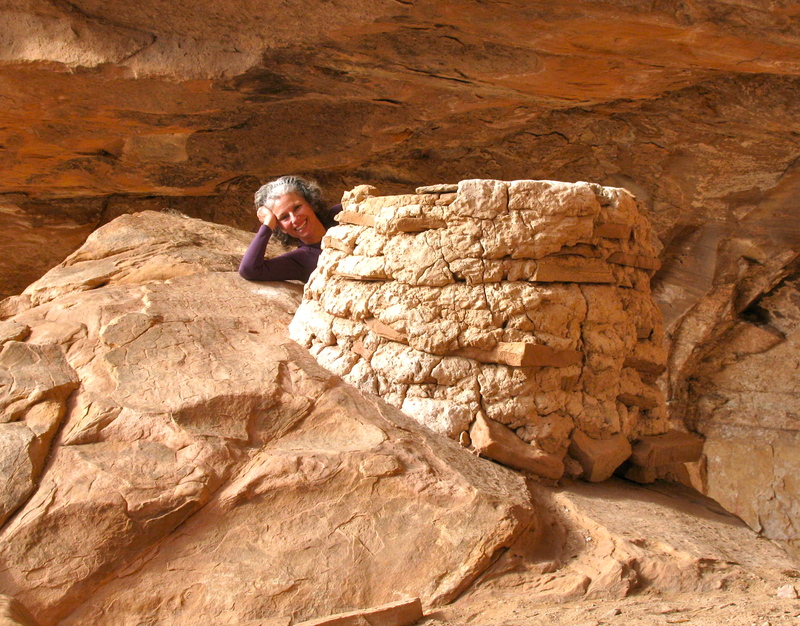 On a recent hike in search of petroglyphs in the Moab area, my findings led me to ask such questions. 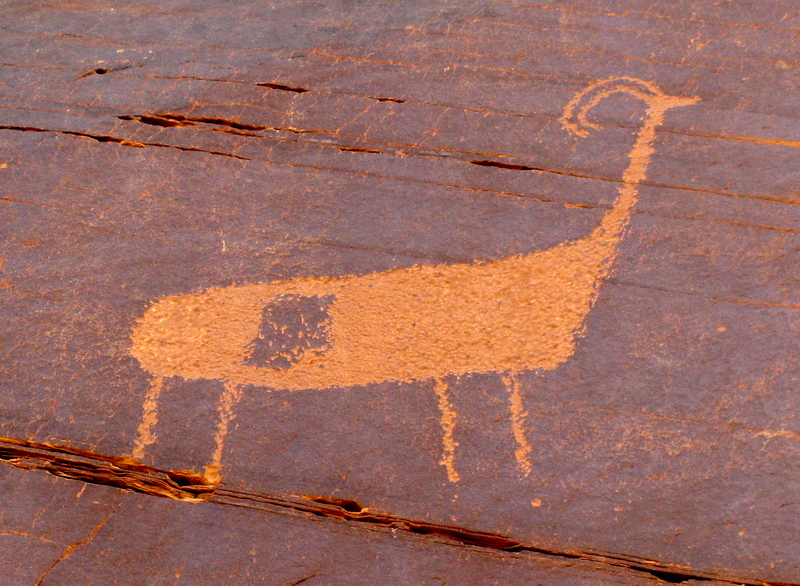 The first panel shows a classic rendering of an abundant animal in Utah rock art, the bighorn sheep. Notice their short thick necks, graceful parenthesis-shaped horns, solid pecked bodies and characteristic single-file arrangement. I especially like the cloven-hoof detail, which can be seen better if you click to enlarge. Only a few feet away, on another part of the boulder, stood this artwork. 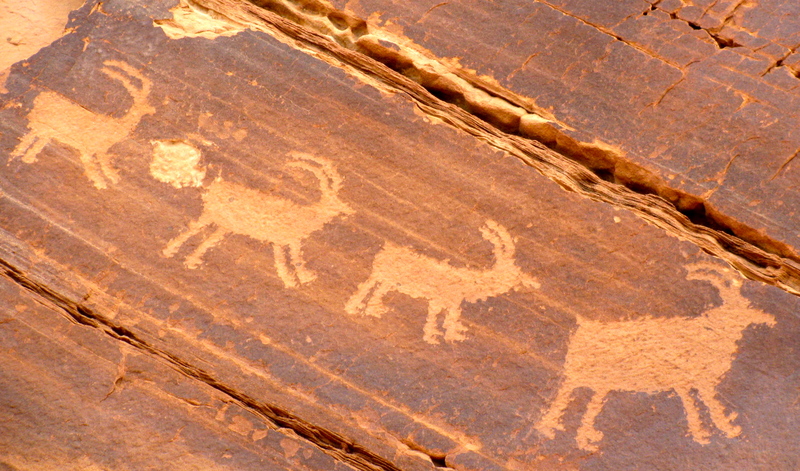 Based on its deeply curved horns, it’s obviously a bighorn ram, but how many differences can you pick out from the previous glyphs? Whose neck is that? What is the shape inside its torso? Is it supposed to have feet? Was this artist having fun, expressing his uniqueness, or faithfully recording his observations? Does this artist march to the beat of a different drummer? Life is amazing. Search engines often aren’t. 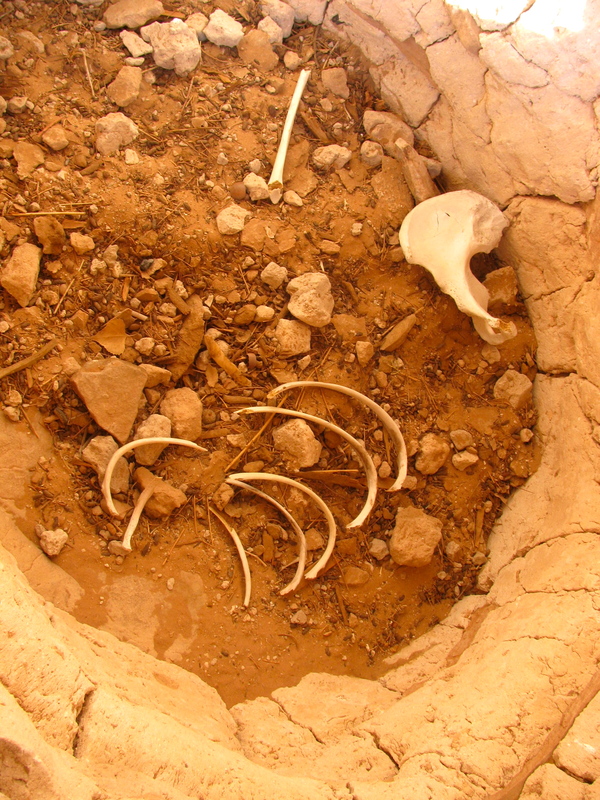 After last week when I was doing an image search for the pelvic bone found in the granary, sidebar ads kept popping up based on the terms I was exploring. Google promised me they were relevant; I shake my head in disbelief to see what appeared. First, a review. That lovely curvy bone you feel (if you’re thin enough) when you put your hands on your hips is your ilium. In front of your bladder is the pubis. When you ride a horse too long, you notice it in each ischium. Those three bones are fused at the acetabulum, which is the round socket that receives the ball of the femur (thigh bone). Most people like their acetabula. They serve you well every time you bend at the hips, which is all the time. Most acetabula happily serve their owners for, oh, a lifetime. Today, make a bold decision. Choose not to be apprehensive concerning your own hip socket. And remember to take search engine results with a grain of salt. Celebrating my 50,000th lifetime blog view last week, I can’t think of a more effective way to communicate what I do and why I do it except to post this photo that a visitor from Australia recently took of me. One needs to walk only one mile from the Grand View Point parking lot to reach this expansive agoraphobic vista. 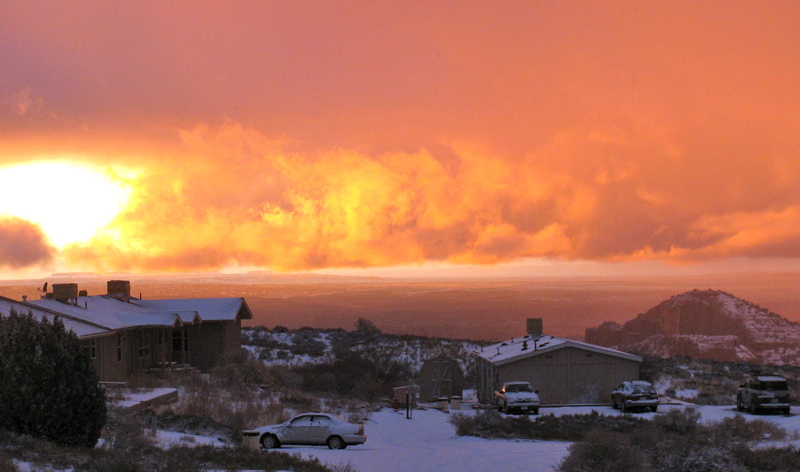 The clouds set up exquisite lighting, and the fresh snowfall created contrast. It is exquisitely suited to my five hundredth blog post. This is not just my job: it is who I am. Halfway back to our car, in the middle of nowhere, a man’s voice hailed us from forty yards above. “Did you visit the ruin site?” he inquired. Tara and I looked at each other, wondering how much to say. Archaeological etiquette calls for much discretion in these matters. My mind careened back to the ribs and pelvis, which we had carelessly assumed were from a deer because that and rabbit are the only kind of bones we ever see. Instantly the niggling disconnect in my brain, the missing piece, came into sharp focus. Now I saw the acetabulum, the cup-shaped depression that holds the head of the femur. Above it, the sweeping curve of the iliac crest was unmistakable. Half of a human pelvis, all right. After talking further and thanking him for his illumination, we made our way down to the car in utter silence. Everything had changed with one sentence. The place we had just explored was not just a food storage site or a group of houses; it was also a family cemetery. Lunch comes out of the backpack: cheese and crackers, apple, sunflower seeds, mixed nuts, chocolate-covered edamame. On a flat boulder that looked perfect for ancestral corn-husking or sunbathing, we munch and hydrate and ponder. Something somewhere in the back of my mind is not right. A detail picked up by my brain is not jibing with all the data, but it flits away again and is gone. We listen to a raven croaking, examine the areas where desert varnish is thick and dark from constant wetting, get down on our knees to look into storage cists dug in the rocky floor, study the partially-burned logs that may provide a clue as to the fate of this dwelling site. 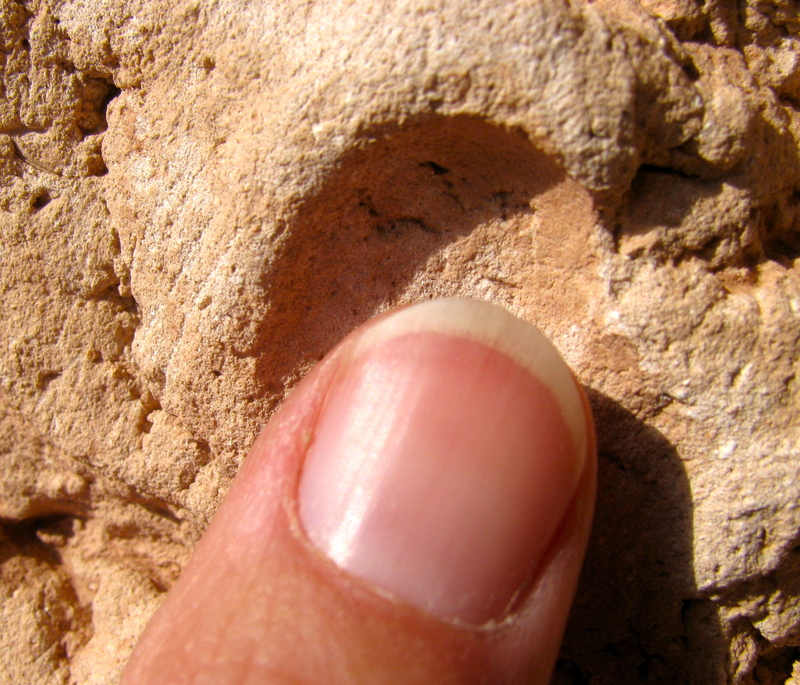 Having found fingerprints in the granary mortar that fit our own digits precisely, we sense an intimate connection to its builder(s). I rest my left thumb on a forebear’s impression in the dried mud; it is my own. Centuries dissolve with a smile.